You can relate yourself to people and things in your immediate daily surroundings in a great variety of ways. Your problem, as an individual, is to find the best way for you to exteriorize and prove to others that which you essentially are as an individual — your true self. if you haven't made a voluntary donation to this site. Click on now to do it the safely and easily . The suggested contribution is $12, though you may offer as little as $1. What we call in a colloquial sense "life" is a series of encounters. When you exclaim in a tone of annoyance or irritation "What a life!" you ordinarily mean that you have run against or counter to (i.e., you have encountered) a variety of incidents or of people that have hurt, frustrated, depressed or angered you. Things around you have not gone the way you would have liked; that is to say, obstacles, resistance, antagonism, enmity of one type or another have met your natural impulse to satisfy the desire for food, love and expansion of your mind and the eagerness of your ego to express its feelings and its characteristic nature. Any living organism and any ego normally wants to maintain itself in a healthy and happy condition, then expand, reproduce and impress upon others what he is. But no person or beast lives in empty space! We come to birth in a crowded world. Every place is occupied; everybody's affections are more or less attracted to various peoples or causes; everybody's time is somehow taken by one thing or another. All the persons you find around you when you are born have to make room for you if you are to have a fair chance to grow healthily among them. Some persons will make eagerly and lovingly (at least for a while!) a living space for you; others will resent your coming, and may either block your every move or fight you. Not only people around you may feel antagonism toward you; large sections of your community may be prejudiced against you because of various conditions or may harshly ignore your needs and troubles on general principles. Then the climate may be bad; food may not agree with you. All in all, your environment may be unresponsive to your appearance into the world — or even inimical. You will know all sorts of obstacles which may make you recoil in pain and fear. You, therefore, will be impressed, and perhaps depressed, by your limitations. These limitations demonstrate to you your own strength and your ability to cope with challenges and tests encountered in your everyday life and wherever you live. It is by becoming aware of these limitations — i.e., of how far you can go in your efforts at conquering the world around you — that you come to know exactly what you are and the value of what you own. It is true that some environments are far more inimical and difficult to live in than others, but, theoretically and philosophically speaking, any one born on earth is born in an environment which provides him with whatever he needs in order to discover what he is as an individual, what his particular destiny is and how to use in his own characteristic way all that he owns at birth (mainly his body and his inherited abilities). If the natal environment is tough, it is because the newborn is meant to develop strength of a sort in making room for himself in it. The needed amount of potential strength is there in him to match the harsh realities of life around him; the individual's problem is to transform this potential and latent strength into actual and effective power. If the individual is apparently defeated, it may be indeed that this seeming outer defeat is just what was needed by the individual soul to discover itself in an inner way or to learn a necessary lesson for future use or to clear up "old accounts" (karma). At least, you can interpret this outer defeat in these many ways if you accept the idea that man is essentially a spiritual entity born into a body in order to fulfill a purpose, that this birth into a body is not the first one for this soul and will not be the last. What should be understood in any case is that as the child comes into the world, he emerges into a definite environment. He must act in relation to this environment. It is in it that he experiences life, other people, many objects. He is challenged to take his own position in this environment, to approach it in his own way. The manner in which any person approaches the people, the things and the situations around him, defines what this person actually is. It defines his character and his resources. You can submit to your environment and develop a sense of passive acceptance or of personal inferiority. You can also fight back against the impacts of life and of people's actions toward you. You can be clever and cunning. You can use your inborn intelligence and instinct of self-preservation in order to change people and circumstances or to use them to your advantage. You can radiate such love and happiness that would-be enemies become friends or servants. In other words, you can relate yourself to people and things in your immediate daily surroundings in a great variety of ways. Your problem, as an individual, is to find the best way for you; and the best way is always the way which enables you to exteriorize and prove to others that which you essentially are as an individual — your true self. In the preceding articles of this series, I have shown how the first house of any birth-chart (a chart calculated for the exact moment of the first breath) indicates our true individual self in this particular life; what we essentially are, our difference from others, our characteristic purpose for being what we are — and also the way in which we can become, actually and precisely, this distinct and unique self by differentiating ourselves from others and establishing our own true rhythm and quality of being. I have shown also how the second house of the birth-chart refers to all inherited and acquired natural abilities, to our inner as well as outer, psychological as well as economic, possessions and wealth. These possessions are for us to use, as individuals. We cannot act in this world without owning some kind of material substance. The body is our first possession; later on, we come to own other types of material and mental properties, money and things of value. Our problem is how to use all of these significantly, constructively, with a sense of responsibility, so as to give us, as individual souls, the material bases of operation from which we can act and the energy or wealth needed for us to act in our own characteristic manner. We are; we own that which enables us to be ourselves, concretely and effectively. But how can we know the value and the power of what we own unless we discover what happens when we start using these possessions of ours! So the third house of the birth-chart is the "field of experience" in which we discover ourselves by testing the reactions of our environment to the way we use what we own. At first, the third-house environment is the nursery, the home, the close neighborhood. In this first environment, we find relatives, brothers and sisters, objects of various shapes, pets perhaps, friends, servants, etc. There is also the mother and, more or less in evidence (depending on social conditions and customs), the father. Our parents, however, constitute a somewhat special case because we have been born from them; we are related to them in an internal and psychic manner. Indeed, the baby at first psychically identifies himself with the mother; it is only when this identification breaks down that the mother becomes truly objective to the child and a part of his life environment; even then, the psychic bond between them makes the problems of child-to-parents relationship mostly a separate matter (a fourth and tenth-house matter, astrologically speaking). The field of the third-house relationships is one in which external entities are things against which, or in relation to which, the child seeks to discover: (1) the extent of his power, (2) the value of what he feels to be his own, (3) the results of various types of behavior. The first gestures of the baby should actually be understood as efforts at finding out how far his body domain extends, how far he can move without encountering resistance of some sort and pain. This is the characteristic third-house problem: how far can I go and get away with it! As the child grows into a adult, this question will be asked at various levels and in a multitude, of ways; yet it remains always the same basic problem: one must discover one's limitations. The best (if not the only really valid) way to discover them is by deliberate tests of strength in which people, objects or living creatures provide the testing mechanisms. The child who asks endless questions usually wants merely to find out how long he can attract the attention of someone — that is, how great is his power over people around him. True education should be directed toward providing for the child and adolescent conditions and challenges which will enable him, in a consecutive and coherent manner, to test one by one all his powers and faculties. To make things easy for the child is senseless; to make them too hard, needlessly confusing or bewildering is even more senseless. Training by providing an environment especially devised to draw out strength, endurance, quick response, adaptability to change and also sympathetic response, helpfulness, kindness, love, cooperation and creative imagination: this is the only valid training and education there is. When there is no such deliberate training, the complex and often chaotic events experienced in one's environment must act as the education. Then the youth may have to see his possessions wasted before he can learn their value and experience much pain before he can be convinced that violent action or stealing "does not pay." At this stage of individual development, however, one can hardly expect the child (or at a higher social level, the individualist bent upon self-expression and egocentric activity) to think in terms of "laws of behavior." The third house is the field of judgments, of value based primarily upon expediency, and directly experienced responses. That the fire burns the finger is then far more impressive than a study of the chemistry of processes of combustion! That the big brother will "sock" you if you keep annoying him is an eminently valid proof that your power over him has obvious limits. That, on the other hand, if you are very good and "play the game" with your uncles or neighbors, you can get from them the gifts you want is also a demonstration of the value of adjustment to the ways of superiors. 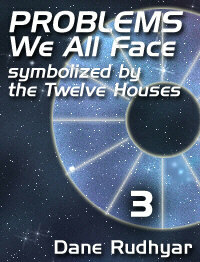 In the third house, everything revolves about the questions: What will this do to me? How can I find out the way to get the most out of the situation? How can I expand, or act the way I feel, without bad results? In this field of experience, the individual is purely egocentric; even kindness and love serve the purpose of personal expansion or personal happiness. All that is sought is to find out how everything works so that it can be used to demonstrate what one is. How does one find it? It is accomplished by the method of trial and error at first, then by the use of intelligence. Intelligence can be defined as the capacity of conscious adaptation to the requirements of the human environment. Intelligence operates by means of processes of thinking. To think is, first of all, to associate impressions and sensations so that we can become oriented satisfactorily toward everyday life. Thinking is conditioned first by the instinct for self-preservation and by the necessity to adjust oneself to outer conditions and to escape dangers of all sorts. It becomes eventually geared to a less immediately utilitarian approach to knowledge; yet at the third-house stage, it remains primarily the knowledge of how to get along and how to discover new ways of being yourself and finding out more about yourself. It is through this use of thought and by developing intelligence (at one level or another) that you can learn how to relate every fact of your daily experience. Intelligence is the ability to establish relationships. If you can establish satisfactory, wholesome and significant relationships between every part of your nature, you can become a well-integrated personality: that is, everything in you serves to enhance and strengthen your ego. There is no violent conflict between a part of yourself and another part, such as happens in the case of a split personality and even of all kinds of acute neurosis. Likewise, if you relate yourself satisfactorily to everyone in your neighborhood, your life becomes harmonious and fulfilling. If you learn to relate ideas with ideas, discovery with discovery, even new words with familiar terms, your capacity for original and clear thinking increases. You become not only learned (through mere memory) but wise (through integrated thinking). It is to all these things that the third house of your exactly calculated natal chart refers. From them, problems constantly arise. They are essentially problems of relationship; but in this kind of relationship, everything is seen in terms of the use you yourself can make of it. Third House problems are very concrete, very practical and immediate in their application. You may take a very idealistic and entirely impractical approach to solving these problems; yet you think you are practical. You are eager to demonstrate this new way of relating things and ideas which is "yours" — your opinion, your vision, your way of meeting problems. You should go ahead! Only you may soon find out by the response of your relatives or neighbors that your way is not the way that works best. Thus, you learn. What Are Third House Problems? The zodiacal sign on the cusp of your natal third house, the planet which is said to "rule" this sign and whatever planet may be found within the space of this house — these three factors are the basic ones to consider in finding out what your basic "third-house problems" are and how best to solve them. The first thing to discover, in such a study, is the basic type of attitude toward (and approach to) your environment and the use of the power of thought which will serve best your purpose in this field of activity. It is a matter of orientation; the twelve signs of the zodiac should be considered as defining, in this case, twelve basic types of orientation. However, one needs great care in applying what one knows of the meaning of the twelve signs to the particular kind of problems connected with the natal third house — and, indexed, with any natal house! In some cases, the zodiacal meanings may seem applicable in a very precise manner; but every sign has a variety of meanings, and it is best here to consider only the most fundamental characteristics of the signs. In closing, let me say that the usual astrological textbook narrows down too much the meaning of the third house; brothers and sisters, short journeys, writing letters, etc., are only expressions of a far wider field of experiences and activities. The third house refers to our capacity to associate personal and immediate experiences into sequences (causes and effects) and groups. Here one comes to know where one is, and how much of an understanding of one's own self one can reach. Here we are in search of connecting links, in search of meanings, in search of demonstrations and proofs. This search is the very foundation of all thinking. It is said: As a man thinks, so does he become. Thus, in this house, we see the individual in the process of becoming what he is — or we see him stumble and fall, the victim of circumstances.